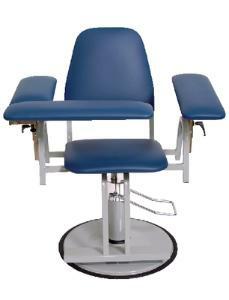 Fully upholstered chairs feature hydraulically adjustable height and two adjustable padded side arms. A third, flip-up padded arm provides safety and comfort for patient and technician. Welded steel construction. Seat height is adjustable from 50.8 to 68.6cm (20 to 27"). Side arms are 17.8cm (7") wide and feature 17.8cm (7") height adjustment. Ordering information: Five-year manufacturer's warranty on chair frame. One-year manufacturer's warranty on vinyl upholstery. Contact your VWR sales representative for additional color choices.